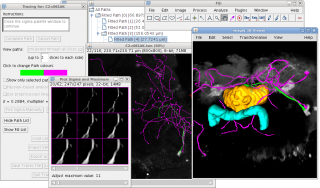 Plugin designed to allow easy semi-automatic tracing of neurons or other filament-like structures (e.g., microtubules, blood vessels) through either 2D images or 3D image stacks. Data can be imported and exported in SWC files for interaction with other software, or details of the traces can be exported as CSV files for analysis in spreadsheets or statistical software. This plugin comes with Fiji.